The Green Space Conservancy Gala Casino Night is pleased to offer a lovely vacation in Vermont. John and Pam Gerstmayr have graciously offered a week’s stay at their cozy cottage in Reading, Vermont. This precious, two-bedroom and two-bathroom home sleeps up to six guests. It has a fully-equipped kitchen, living and dining rooms, and is decorated with local, rustic furniture. It is located on their 115-acre estate which includes a swimming pond, apple orchards, miles of hiking trails and breathtaking views. 3 Mountain Farm is beautiful in every season and surrounded by 800 acres of conserved land. 3 Mountain Farm is just a short drive to charming Woodstock, Vermont, where you will find historic buildings on the Green, quaint and elegant shops and sophisticated as well as casual dining. You can visit Billings Farm and Museum, Sugar Bush Farm, or spend the day at Marsh-Billings-Rockefeller National Park. There is also plenty of challenging winter skiing – such as Suicide Six and Killington Downhill Ski Areas. Their cottage is only 40 miles from Dartmouth College – a wonderful day trip from Reading. 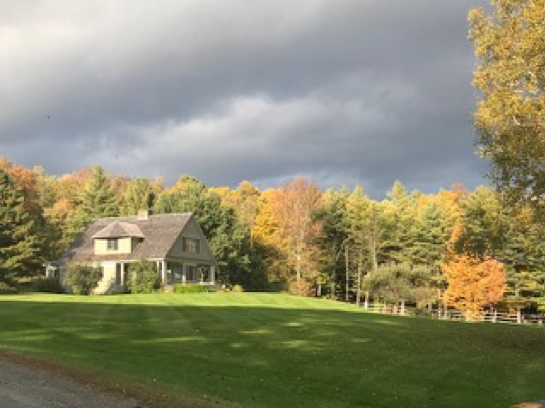 John and Pam lived in Boston for many years until they decided to build their dream home on 26 acres in Reading, Vermont, in 2000. Soon afterward, they were able to purchase adjoining property, including their cottage, resulting in the 115 acres they now own. They love entertaining their family and friends at 3 Mountain Farm and John makes apple jam, cider and wine during the apple harvest season. They are both very active in the local Vermont scene where John continues pro bono work in their community. Pam is also a vibrant part of their community and loves riding their horses, especially with her grandchildren. Some years ago, they purchased their home on Seabrook Island to escape those cold Vermont winters. They are proud parents of three children and nine grandchildren!